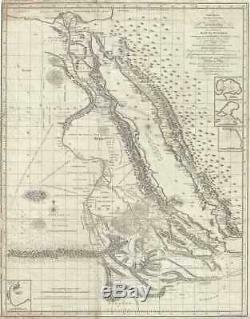 1790 James Bruce Map of Egypt, Abyssinia, and the Red Sea. WE SELL ONLY ORIGINAL ANTIQUE MAPS - NOT REPRODUCTIONS JOIN OUR WEEKLY MAILING LIST FOR NEWEST STOCK. This map, Containing a Chart of the Arabian Gulf With its Egyptian, Ethiopian and Arabian Coasts, from Suez to Bab el Mandeb, A Journey through Abyssinia to Gondar, its Capital, From thence to the Source of the Nile, The Whole of that River, from its Source to the Mediterranean, Now first laid down from Astronomical Observations of All those points necessary to Aseertain the form of its Course, Teh Return by Sennaar and the Great Desert of Nubia and Beja All laid down by Actual Survey with the largest and most perfect Instruments now in use by His Majesty's most dutiful and faithful Subject & Servant, James Bruce. Description: This is a fascinating, significant, beautifully engraved, intricately detailed 1790 map of Egypt, Abyssinia, and the Red Sea by the Scottish adventurer James Bruce. Centered on the Nile Valley, this map covers all of Egypt, Abyssinia, and the Red Sea from the Mediterranean to the speculative tribal Kingdoms of central Africa, inclusive of the Arabian coast as far as the Cape of Babelmandeb. The map plots Bruce's travels in search of the source of the Blue Nile. Starting in Alexandria, Bruce traveled south up the Nile as far as Thebes or Luxor before venturing overland to the Red Sea coast. There, disguising himself as a Turkish sailor, he navigated the Red Sea as far as the port city of Massawa, where he disembarked and journeyed inland to the Ethiopian capital of Gondar. From there local guides led him southwards to Lake Tana (Tzana) and eventually along the Abay River to Gish Abay, the source of the Blue Nile. Bruce claimed to have discovered the Gish Abay springs, but in a fact that he was well aware of, was merely retracing the steps of the Jesuit missionaries Pedro Paez and Jeronimo Lobo. Bruce then traveled northwards, following the Blue Nile to its confluence with the White Nile in Nubia, before following an overland caravan route to Syene and thence back into Egypt. Bruce's exploits were ridiculed in his day, but much of the information he collected worked its way into the cartographic corpus, appearing in later maps of the region by Cary, Thomson, Pinkerton, and others. Cartographically this map makes a number of advances and well as promotes a number of misconceptions associated with Bruce's theories. The course of the Blue Nile as well as much of the Abyssinian interior is meticulously mapped and, by and large, accurate. His mapping of the Red sea is equally impressive. Bruce's cartography becomes more speculative along the course of the White Nile and westward into Kordofan and Nubia. The White Nile itself is truncated with its source identified as mountain ranges in the Christian Kingdom of Caffa (Kaffa) - affirming Bruce's erroneous claim that the Blue Nile was actually the longer more important river. Further a fictional mountain range called the'Deir and Tuggula Mountains' extends indefinitely westward from the White Nile. This range, postulated by the explorer Browne, appears in many late 18th and early 19th century maps and is most likely associated with speculations on the source of the Niger River. Many claim that this map and Bruce's explorations in Abyssinia also contain a subtext relating to his Masonic and Templar associations. Bruce's ancestor, the Scottish King Robert the Bruce, harbored many of the Knights Templar during their prosecution in the 14th century. Some believe that Bruce inherited secret knowledge that sent him to Ethiopia in search of Templar artifacts including, among other things, the Ark of the Covenant. Bruce himself remained silent on this matter âÃÃ¬ which is perhaps as telling as not âÃÃ¬ but to this day many, including most Ethiopians, strongly believe that the Ark resides in the Coptic sanctuary of Axum, which Bruce indeed visited. Walker of Cavendish Square for James Bruce's five volume 1790 opus, Travels to Discover the Source of the Nile. Size: Printed area measures 25 inches high by 20 inches wide. Some wear and damage along original folds. Narrow margins show some edge wear. If your address is a P. DHL International EXPRESS (45 USD). We can use your Federal Express Account. Duty varies by country and we cannot predict the amount you will be charged. Some countries are duty free, others are not. Additional Services Conservation Framing Services: Geographicus recommends basic conservation framing services for any antique paper. We do not offer this service. Antique Map Restoration Services: Geographicus can repair and restore your antique map. Services include deacidification cleaning flattening and backing. The item "1790 James Bruce Map of Egypt, Abyssinia, and the Red Sea" is in sale since Thursday, July 19, 2018. This item is in the category "Antiques\Maps, Atlases & Globes\Africa Maps". The seller is "geographicusmaps" and is located in 11221. This item can be shipped worldwide.